Unzué is the new FC Barcelona assistant manager. But do you remember who his five predecessors were? Juan Carlos Unzúe will be Luis Enrique’s assistant at FC Barcelona, a club where he has already worked in different roles before. He continues the legacy of some memorable figures from the last decade, and here’s a reminder of who they were. Frank Rijkaard’s right-hand man for three seasons was a former player with a strong character who made a major contribution to the re-establishment of Barça among the continental elite. He helped the club to Liga titles in 2004/05 and 2005/06 as well as the 2006 Champions League and the 2005 Spanish Supercup. His successor was his compatriot, Johan Neeskens, a man who also played for Barça in the seventies. As assistant to Rijkaard from 2006 to 2008 the only title he won was the 2006 Spanish Supercup. There was a change of manager in 2008, and also a change of assistant. Josep Guardiola was promoted from the reserves, and was followed by another former player, Tito Vilanova, and a fellow product of Masia, who knew the Barça system inside-out. Tito was assistant to Guardiola for four years, the most glorious period in the history of the Club, winning an amazing 14 major titles. Josep Guardiola’s departure led to Tito Vilanova taking over as first team manager. Another former player, match analyst Jordi Roura, was appointed assistant to Tito, and helped FC Barcelona to the record-breaking 100 point Liga season. 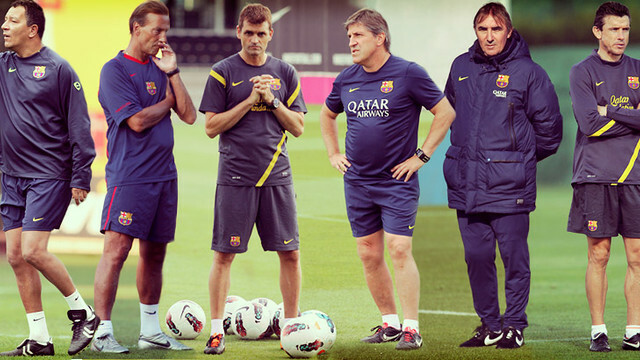 Jorge Pautasso came to Barcelona along with Gerardo Martino, becoming the first Argentine assistant manager since Rogelio Poncini in 1984, César Luis Menotti’s assistant. Pautasso, who played professionally in Argentina and Chile, was only at Barça for a year and didn’t win any major silverware. The latest assistant manager at Barça is Juan Carlos Unzué, who played in goal for the club in 36 official matches. This is his third period at the club. From 2003 to 2010 he was first team goalkeepers coach. He left in the 2010/11 season to take over as manager of Numancia, and returned to his former position as FCB goalkeepers coach in 2011/12. He spent the last season as assistant to Luis Enrique at Celta Vigo. Previous Previous post: The FC Barcelona player @gerardeulofeu on his return to Can Barça: "I'm very happy to come home"